Penhow Nursery is a family run company. Established by Jimmy Jones in 1985 growing and producing ornamental plants. A few years later on one of his plant finding trips to South Africa Jimmy was inspired by the unusual beauty of the uncultivated Nemesia and Diascia which were growing on the Dracenberg mountains at different altitudes. Jimmy’s goal was to develop these two species into a more prolific, compact, and larger flowering plant with many more colors. During his breeding work on Diascias, Jimmy came in contact with a fellow plant gentleman, the late Hector Harrison, who shared the same passion for the Diascia species. Penhow Nurseries breeding work has established itself by producing the most innovated varieties of these two species. Creating a longer flowering season, compact range of colors, and the most highly scented. At our nursery we maintain a strict hygiene program to produce trouble free plants for our customers which is done through a method of virus-clean index stock. 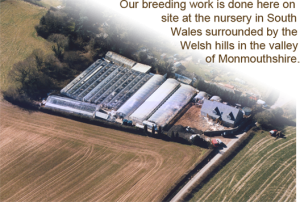 We are licensed by the ministry “Defra” who oversee the high standard we set at our nursery. We have created these unique Maritana™ collections through our intense breeding programs. Through this process, at the nursery we produce approx: one quarter of a million new seedling varieties each year. Some of these varieties can take any where between two to eight years to develop and only a few will then be selected through this process, these selected varieties are then sent for trial to countries ie Europe, USA, Canada, Mexico, Japan, Australia, and South Africa where they are eventually grown for retail outlets. PlantHaven® International, Inc was founded by Geoff and Maureen Needham in January 1997 in response to a growing demand from plant breeders for good advice and representation in the North American market. We are an independent agency assisting plant breeders worldwide in bringing their new plant varieties to market. Through careful guidance, PlantHaven has nurtured many breeder relationships offering advice and service in market research, performance trials and patent protection. Our overall objective is to help the industry perceive the superiority and profitability of a PlantHaven-managed plant. Our cultivars undergo nationwide testing and trialing ensuring consistency and plant worthiness in our different climate zones. We have developed systems and methods allowing us to assemble a unique set of significant new plants for the garden and landscape markets. The reputations of the plants work to support each other. For PlantHaven, the plant itself has always been the primary focus. PlantHaven does not breed or grow plants, nor has any financial interest in any breeding program or nursery. Our revenue arises directly as commission on royalties. Our clients include independent breeders, breeding companies, and universities. Our goal is to maximize the market potential of a plant over the life of the patent. PlantHaven successfully matches the appropriate growers with specific plants in various climate zones to promote the best growing environment for each cultivar. The company manages approximately 100 nursery licensees in the United States and represents its breeder-clients in the Canadian Ornamental Plant Foundation. In addition, PlantHaven sets up and manages agreements for secure testing of new varieties and for variety protection through Plant Breeders Rights and U.S. plant patents. We have built an impressive catalog offering more than 700 new varieties from more than 80 genera in commercial and landscape evaluation trials at appropriate locations in North America. And, we collaborate with like businesses internationally towards the goal of simultaneous worldwide new variety testing, protection and marketing. Each year we arrange for a limited amount of sample plant material to be grown for garden writers to plant at home or used in photo shoots.